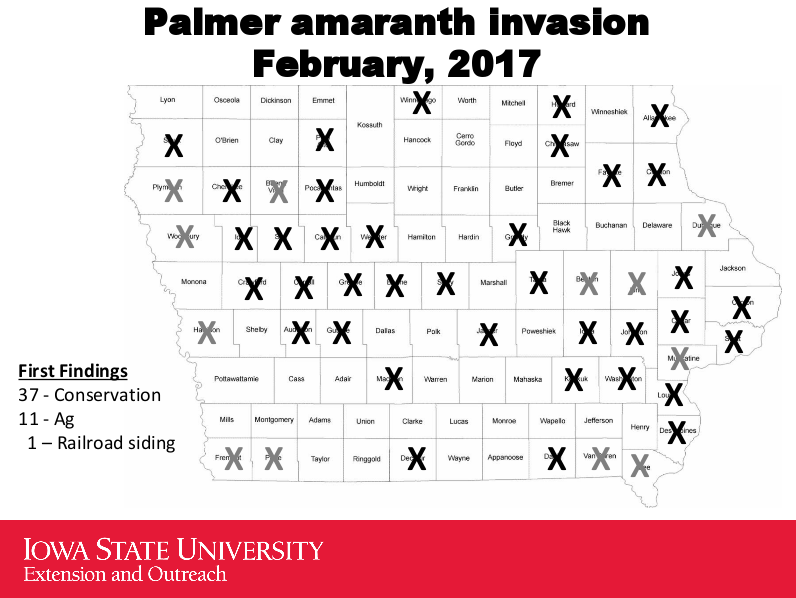 In 2016, the “super weed” Palmer amaranth (Amaranthus palmeri) made headlines when it appeared in conservation plantings in dozens of Iowa counties. This was not the first time the noxious weed had appeared in Iowa. Palmer amaranth infestations first arrived in 2013, brought in by crop production materials and equipment. Image courtesy of Iowa State University Extension. The speed at which the weed showed up across the state brought attention to the risks of purchasing prairie seed from out of state. This would be an easy place to tout the virtues of local ecotype seed (there are many), but it is important to know that contaminated seed came from both out of state dealers as well as Iowa seed growers who augmented their supply with selected species (purchased from out of state) to increase diversity. These Iowa seed dealers are working hard to eliminate contamination in their supply. The risk of Palmer amaranth contamination can be further reduced by purchasing seed from Iowa growers who grow 100% of their seed (and have clean fields). Alternatively, you can purchase seed from Iowa growers who show that select species purchased from out of state to increase diversity have tested negative (in a reputable seed lab) for the presence of noxious weeds. 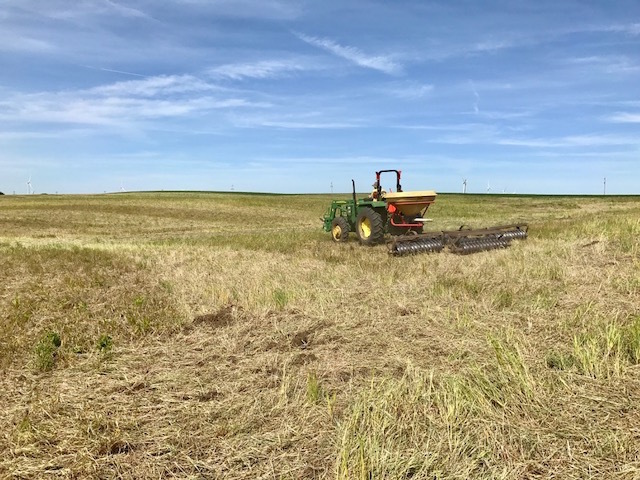 Local ecotype prairie is seeded on a farm in central Iowa. Seed retailers are using extra caution in growing and purchasing seed after Palmer amaranth appeared in several conservation plantings in 2016. Strategic mowing coupled with the occasional use of prescribed fire is the best way to ensure a successful, resilient prairie reconstruction that will not be susceptible to annual weeds such as Palmer amaranth. 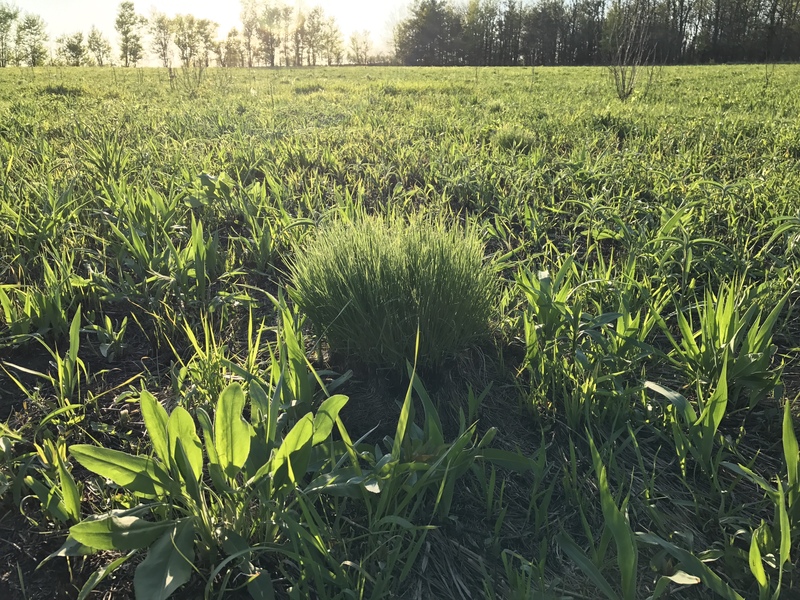 See our blog, Mowing for Prairie Establishment Success for detailed recommendations on prairie establishment. And if Palmer amaranth happens to show up before establishment is complete, you will be ready to kick into action with the following resources, and the help of an ISU Extension agronomist, Certified Crop Advisor, or your local NRCS field office staff. 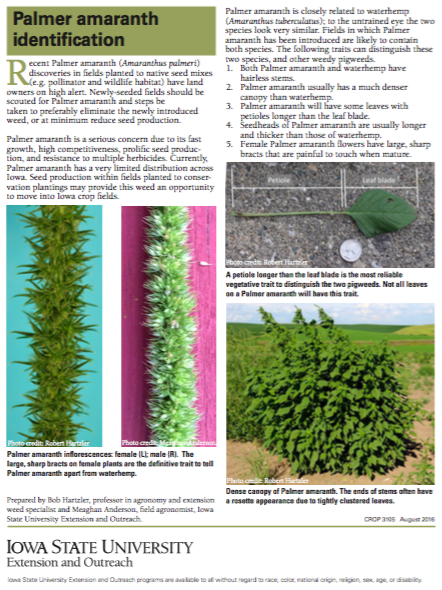 Download the Palmer amaranth identification guide (free) at the Iowa State University Extension store.